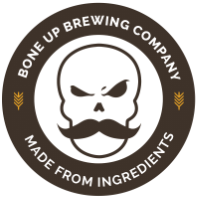 Stats: DNA - Bone Up Brewing Co.
Food Pairing: Steak sandwich covered in hot sauce. Best Occasion to Drink: While DnA's Evolution is onstage at our birthday party! Brewers' Notes: It's our birthday and we'll brew a bunch of concept beers if we want to, dagnabbit! In this case, we tasked ourselves with brewin' up some suds to go with the song styles of DnA's Evolution, and the notes that they play stirred something deep within our souls that spoke to us in an ancient, forgotten tongue - the words may have been unclear, but the message was understood as crystal: "pale ale." So we made a pale ale! We started with a tried-and-true recipe, adding a twist here and a turn there and then a bucket or so of Mass-grown Magnum* and now we've got this tasty beer!